iLoveToCreate Blog: Have you entered the Craftzine/Crafty Chica challenge? Have you entered the Craftzine/Crafty Chica challenge? 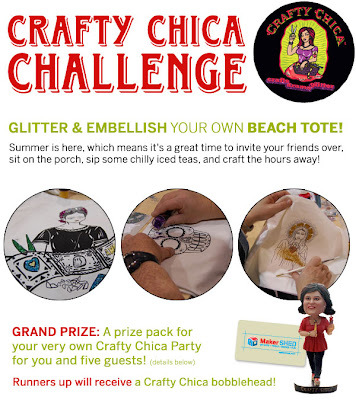 There's still time to enter the Crafty Chica Challenge! Take an existing tote bag you have and glitter it up. Then, add it to the Crafty Chica Challenge Flickr Group. The Grand Prize winner will receive a prize pack for your very own Crafty Chica Party for you and five guests! Deadline for entries is July 17th. To find out more about the prizes and the official rules, visit the contest page. The Grand Prize winner will receive a prize pack for your very own Crafty Chica Party for you and five guests! * 30-minute crafty conversation/coaching session for your party (or just for you) with Kathy Cano-Murillo. * $100 discount off of the Crafty Chica Art Cruise package. * 6 sets of Crafty Chica Mojito Papers. * Crafty Chica Wood Boxes (great for making a shrine for something you love). * 1 set of handmade invites and a paper banner handmade by Kathy Cano-Murillo, the Crafty Chica! * 10 jars of Crafty Chica Glitter. * 1 Crafty Chica Wish Granter Empowerment Guardian for you to decorate to bring cheer to your party! * 1 copy of Kathy's book, Crafty Chica's Guide to Artful Sewing. * 1 mixed CD of music to craft to, chosen by Kathy. * A blog post about your party on Kathy's blog. Three (3) runners-up will receive a Crafty Chica bobble head and a $25 MakerShed Gift Certificate. Deadline is extended to 07/24/09. Head on over to the Crafty Chica Challenge Flickr group. 1. No purchase necessary to enter. A purchase will not improve your chances of winning. 2. Contest begins at 12:01 AM Eastern Time (ET) on 6/19/2009 and ends at 11:59 PM ET on 07/17/2009. Everyone may enter by submitting their information to the 'The Crafty Chica Challenge' Flickr group so it is received by 11:59 PM (ET) on 07/17/2009 07/24/09 (deadline is extended). 3. Prizes: The Grand Prize winner will receive a prize pack for your very own Crafty Chica Party for you and five guests! 4. Winners will be selected by The Crafty Chica from among all eligible entries received. Winner will be notified by e-mail, mail or phone. If a prize or notification is returned as undeliverable, the corresponding prize will be awarded to an alternate winner. Winner may forfeit prize if Sponsors are unable to contact him or her within 7 days of first attempted notification. No prize substitutions will be permitted, except Sponsors may substitute any prize with one of equal or greater retail value. Prizes are not transferable or redeemable for cash. Acceptance of prize constitutes permission (except where prohibited by law) to use each winner's name, prize won, hometown and likeness for purposes of advertising, promotion and publicity including online posting without additional compensation. 5. Contest is open to adults, 18 or older. Employees of the Sponsors, their affiliates, subsidiaries, distributors, retailers, advertising and promotion agencies, and the immediate families of each are not eligible to enter or win. All federal, state and local laws and regulations apply. Void where prohibited by law. 7. Sponsors are not responsible for lost or late entries nor for electronic transmission errors resulting in omission, interruption, deletion, defect, delay in operations or transmission, theft or destruction or unauthorized access to or alterations of entry materials, or for technical, network, telephone equipment, electronic, computer, hardware or software malfunctions or limitations of any kind, or inaccurate transmissions of or failure to receive entry information by Sponsors or presenter on account of technical problems or traffic congestion on the Internet or at any Web site or any combination thereof. If for any reason the Internet portion of the program is not capable of running as planned, including infection by computer virus, bugs, tampering, unauthorized intervention, fraud, technical failures, or any other causes beyond the control of the Sponsors which corrupt or affect the administration, security, fairness, integrity, or proper conduct of this Contest, the Sponsors reserve the right at their sole discretion, to disqualify any individual who tampers with the entry process, and to cancel, terminate, modify or suspend the Contest. Caution: Any attempt by a contestant to deliberately damage any Web site or undermine the legitimate operation of the game is a violation of criminal and civil laws and should such an attempt be made, Sponsors reserve the right to seek damages from any such contestant to the fullest extent of the law.